Mega Sale! 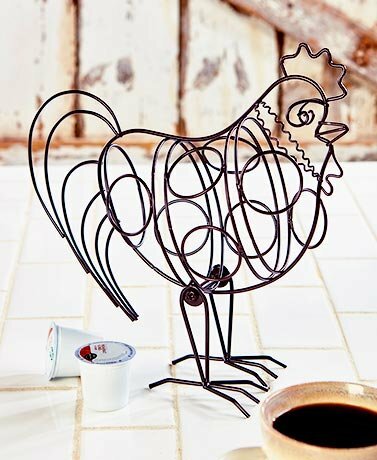 Save 27% on the Rooster Farmhouse Coffee Pod Holder. Metal. by Generic at Rat Coffee Shop. MPN: 4335458758. Hurry! Limited time offer. Offer valid only while supplies last. Add country charm to your kitchen with this Farmhouse Kitchen Collection. Its dark brown and ivory color combo coordinates with any existing decor. Add country charm to your kitchen with this Farmhouse Kitchen Collection. Its dark brown and ivory color combo coordinates with any existing decor. The Milk Can Measuring Set includes 1/4, 1/3, 1/2 and 1 cup measures. Dolomite. Dishwasher, oven and microwave safe. The 96-oz. Pig Bowl (5-1/2"W x 12"D x 6-1/8"H) looks cute on the countertop holding fruit. Ceramic. Oven and microwave safe. The Pig Paper Towel Holder (6-1/4"W x 18-1/2"D x 6-3/4"H) holds a standard roll of towels. Cold cast ceramic and wood. The Rooster Coffee Pod Holder (12-3/8"W x 4-1/8"D x 11"H) holds up to 8 pods. Metal.